Sea Ranch weather can be a tricky proposition to understand at best. I’m often asked by brides wanting to book Abalone Bay for their honeymoon if summer has the perfect weather for their wedding. Of course, the one thing you don’t want to do is make the wrong assumptions of what it might be like when you take your family vacation here. The only sure bet is that Sea Ranch weather will surely change, no matter the season or time of day. So be prepared to enjoy all the wonderful weather our area has to offer! Sea Ranch Weather Assumption #1: California summers are always hot and sunny! All those endless summer movies you’ve seen featuring California’s sunny coast are more Hollywood than real. While the sun will come out…eventually…it’s more likely that your summer days will be cool and foggy. In fact, Mark Twain could have been speaking about Sea Ranch weather when he exclaimed the coldest winter he experienced was summer in San Francisco. Summer months, especially in June is when we along the coast of our Golden State experience the “June gloom” – low clouds and fog during the morning hours, which usually burn off midday or early in the afternoon. In fact, Sea Ranch along the Mendonoma Coast is where our neighbors in interior California make their great escape to cool off. Actually, our marine layer of cool moist air serves as Mother Nature’s air conditioning. During a summer’s day, it sits just offshore waiting to make its move. As the inland heats up this cool air is slowly drawn into The Sea Ranch, rises over the coastal hills blows into the scorching valleys to moderate their warming temperature. If it is a summer’s day you are longing for, you’ll want to book it in the fall. The offshore breezes tend to lessen as well, given the circulation of cold waters and warm inland temperatures have subsided. When this happens you’ll definitely want to bring summer, lightweight clothing. When booking a vacation rental, such as Abalone Bay, or a hotel, you’ll discover that they may not have central air conditioning. For the most part, California coastal business and homes rely on the offshore breezes. To offset that odd day when there is a heat advisory (we’re talking in the 80’s here), you’ll want to make sure there are air ventilation fans available. In Abalone Bay, we provide fans for the bedrooms and for the main living area. Make the best of a foggy summer’s day. In fact, many in the know come to Sea Ranch just for the fog that makes summer weather tolerable. As the fog tippy toes in, brew a fresh cup of coffee or hot cocoa, cuddle in a warm throw, and stretch out on a window seat with a view and your favorite book or e-reader. Who knows… you may find yourself with someone wanting to read over your shoulder! Were it not for the regular rush of cool, wet air our iconic redwoods would not be able to survive. A foggy day can bring as much as 39 liters, or nearly 10 gallons, in a single day. Not only do our redwoods soak up moisture from its roots, but it also absorbs it from its leaves as the fog envelops it. Other forest plants benefiting from our fog-soaked ecosystem include sword ferns, huckleberries, and tanoaks. Were it not for the fog Sea Ranch’s ecology would simply not exist. Just because it’s a California beach doesn’t mean you can swim in just your bikini. If this is your ideal for a summer vacation you may be disappointed. Even if we didn’t have the fog cooling our summers, the Sea Ranch’s ocean temperatures would still be cold. The cold water is a result of the California Current. Unlike the waters of the same latitude on the east coast, our northern waters are cooler. Adding to the chill factor is the upwelling of the colder sub-surface waters, caused by the prevailing northwesterly winds. The upwelling and resulting winds are the mechanisms that produce California’s characteristic coastal fog we spoke of above. 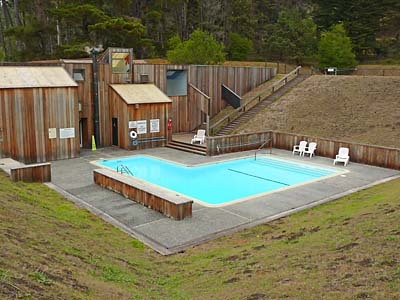 To swim comfortably in Sea Ranch you’ll need to wear a wetsuit, fins, mask, and snorkel. And don’t forget to add your 25-pound weight belt! Abalone divers dressed for a swim in the Sea Ranch coves. 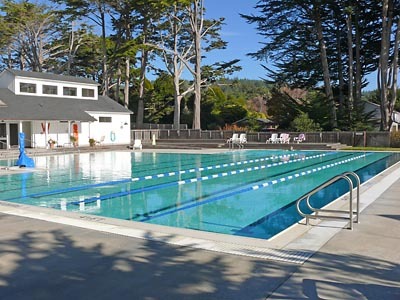 Sea Ranch has three recreation centers each with a solar heated pool to enjoy no matter what the Sea Ranch weather conditions. Here you can use your bikini. Of course, you’ll still want warm clothes to dress back into. Del Mar Center (DMC) Location: 40600 Leeward Rd. – west side of Highway 1 (mile marker 56.88), turn on Deer Trial. Facilities: Large outdoor heated pool (40 ft./12 m. wide x 82 ft. /25 m. long + shallow area), saunas, 2 tennis courts. During the winter months, only the Del Mar Recreation Center is open. Ohlson Recreation Center is closest to Abalone Bay Vacation Rental. Location: 37600 Highway 1 – west side (mile marker 53.76), enter south of Knipp-Stengel Barn. Facilities: Large outdoor heated pool (28 ft./8.5 m. wide x 82 ft. long /25 m. + shallow area), saunas, 3 tennis courts, half-court basketball, volleyball court (basketball & volleyball available upon request at ORC kiosk). Location: 35336 Moonraker Rd. – west side of Highway 1 (mile marker 51.06). Facilities: Small outdoor heated pool (20 ft. wide x 33 ft./10m long + shallow area), saunas, tennis courts. Actually, California frequently suffers drought conditions. On average, Sea Ranch weather statistics record 261 sunny days per year. So odds have been if you booked a vacation to Sea Ranch during the winter- or any time of the year for that matter-you have not experienced any rain. However, that being said if California experiences an “El Niño” year, the odds of it raining frequently and with force are likely. In fact, the rains we experienced in February 2019 wiped out our long-endured drought in California. Naturally, locals reveled gleefully over our many rainy days in winter. The average rainfall for Sea Ranch is nearly 38 inches. We actually are always hoping for even more. Keep calm- All is good! All is not lost if you happen to be staying at Sea Ranch during a rainy day your vacation. Because of the strong coastal winds of The Sea Ranch weather, the community has become a standard for building within the ecology of the land, environment, and its ecosystems. Sea Ranch was designed over 5o years ago specifically to shelter its buildings, homes, and recreation areas from the steady coastal winds. You’ll discover architectural gems nestled within the hedgerows, plant groupings of native species, and berms. Landscape architect Lawrence Halprin lead the way in Sea Ranch’s development by developing its ethos of “living lightly on the land.” His revolutionary approach to building is still studied and admired around the world. Halperin took advantage of old plantings, meadows, and cypresses to shelter the houses. His designs of a wedge and shed shapes deflect the winds. A marriage of nature and architecture! Because of the inventiveness of its architects and their vision, Sea Ranch continues to inspire in its beauty. Sea Ranch’s concept, daring in its invention, is a covenant with nature and the land is a work of art. Sea Ranch provides guests an audio tour self-guided walking tour among these building treasures to learn and appreciate these innovators of architecture. The tour is recorded in audio so that you can experience it on your own…walking in the field with a mobile device or at home. As you pass along the trail you’ll hear the history of design and innovation that each home inspired, noting the ideas and features that have made it The Sea Ranch world renowned. It visits the area where the first Sea Ranch buildings were built and describe the landscape that surrounded them and how that has changed. Written and narrated by Donlyn Lyndon, one of the original architects, this self-guided audio guide explains what was intended in planning The Sea Ranch and in creating these first buildings. Lyndon comments, as well, on the evolution of the landscape during the subsequent fifty years. It should be noted here that this audio tour guides you along walking trails of the area; it is not a house tour and does not include visits to the interiors of homes or condominiums. The tour is a celebration of the larger landscape and the ways in which architecture and its placement can combine with the landscape to create a very distinctive sense of place. Modern-day explorers will find Placenotes, a newly created digital guide to The Sea Ranch, an easy means to access new layers of images and information about landscape and architecture, flora and fauna, culture and history. Currently available for sale online, Placenotes was created and sold by the Charles Moore Foundation, as a travel guide that seeks to lead people to places that truly matter. It aspires to guide you, not to the everyday mundane, but rather to the places that move, inspire, and amuse us, to places that linger in our memories and imagination. Wholly and wonderfully digital, the PLACENOTES App is available for all of your mobile devices, both smartphones, and tablets. When staying at Sea Ranch or anywhere along the Mendonoma coastal area be sure to pack sufficient clothing to dress in layers. Our daily weather patterns can change as quickly as the wind blows. During any given point in the day, Sea Ranch weather can change from damp and foggy, to crystal clear and sunny, to blustery and cold, then back again to foggy. You may find it warm in the sun but cool in the shade. For that reason we always advise you pack for a variety of weather conditions. Then once here dress in layers. Be sure to bring a wrap- or have a friend who doesn’t mind sharing his coat. And next time flats! Even if you are attending a formal wedding or similar event in Sea Ranch we recommend leaving the high heels at home. Instead, wear dressy flats. And don’t forget to bring your trail-worthy shoes for hiking later. During winter, it’s cold at night and in the morning, sometimes enough for frost to happen. Then it can warm up to nearly 70 degrees in the middle of the day if you’re standing in the sun. We may have brilliant days of azure skies and golden sunshine, but it’s still too cool to forego a winter’s sweater or coat. In summer, as interior valleys heat up, the rising air siphons in the coastal chilled air in its place. Once that cooler ocean air hits the coast it transforms into a fast-moving, bone-chilling, wet fog. Having only summer lightweight clothing would certainly lead to hypothermia. During the fall and spring, Sea Ranch weather patterns become more settled. However, there are no guarantees it will stay that way! Sea Ranch culture is very laid back and embraces getting out into nature. Therefore, the general dress code for the area is casual. It is not unusual to see folks dressed in their hiking garbs while dining at one of the restaurants in town. Recommended wardrobe pieces include long slacks or jeans. Many here prefer trekking pants especially the ones that unzip into shorts. Athletic wear that can double of street garb will work well too. 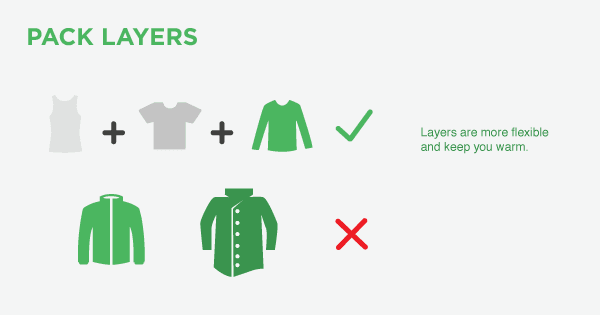 A shirt and sweater or sweatshirt combo can be dressed up with a shawl. Shoes can vary from fancy flats to cozy Uggs. Nevertheless, if your feet are impervious to the cold, by all means bring your flip-flops too. As you have learned, our seasonal weather patterns in Sea Ranch do not always match up with the rest of the world. This is what makes us special and a bit quirky. This is why people come to Sea Ranch. The terrain is rugged, the surf treacherous, the ocean cold. Winds have sculpted cypress and pines into rhythmic shapes. The climate ranges from bright sunshine to dense fog, howling winds and pelting rain – sometimes all in a single day. The weather, the season and the time of day all contribute to The Sea Ranch’s dramatic beauty. Assume nothing ~ Enjoy it all! Are you interested in learning more about a stay at Sea Ranch and Abalone Bay? Be sure to sign up for our email for upcoming information regarding our 2016 calendar. Give us your thoughts about your assumptions about Sea Ranch weather and other aspects of the Mendonoma coast. And don’t forget to share this post with your friends so they too will not have any wrong assumptions about this wonderful weather wacky slice of the world. Great site! One tip–lap swimmers want to know the length of the pools in meters, not feet. Ohlson and Delmar are each 25 meters long. Thanks so much Anne for your kind words about our site. And… Very true- we swimmers do think in meters. Curious how the Association notes the measurements. And let me add… Moonraker pool is 10 meters long. It’s the smallest complex. I’ve updated the text to show meters. BTW- it was in a pool that I met my husband: He was on the swim team for Solano Community College, I was the timer in his lane…and the rest- as the say is history. Prices to enter the pools? Hey Matt- Great question! Use of the pools is free. The only thing you need to bring with you is your community pass. That’s the the white (soft copy) portion of your guest pass you will receive upon check-in. A maximum of six (6) guests may be issued access to use of the Recreation Centers. Residents and guests alike must have their passes with them to register for use of the 3 Recreation Centers. Your guest pass gives you access to all three pools, tennis courts, basketball courts, locker rooms and saunas. You also need it with you when you hike any of the trails along the property that are not public access only. You will also need your hang tag displayed on the interior rearview mirror of your vehicle if you plan to drive to any of the Recreation Centers or park along the private roads at designated locations throughout The Sea Ranch. The hang tag is the hard copy of your white guest pass. A maximum of two (2) vehicle passes may be assigned per home. Additional vehicles can be parked at the home within the screened parking area and within accessible garages at the home. It’s also important to remember- Failure to display the guest pass will result in the vehicle being “booted” by The Sea Ranch Association Security Department. A $100 fee will be charged by The Sea Ranch Association Security Department to remove the boot. Beach Rentals shall remain harmless if the “boot” is applied. So I suggest just leaving your hang tag on at all times and you won’t have an ugly and costly surprise spoil your vacation! Your caption for the architects’ photograph is incorrect. From left to right, they are: Richard Whitaker, Donlyn Lyndon, Charles W. Moore, and William Turnbull, Jr. I appreciate your visit to our site. Thanks so much for your correction! I’ll correct it accordingly. Are pets generally allowed to the community center (pools)? Thanks for your question Josh. I’ve not seen any pets at the pools. I believe they are not allowed. I will verify and update my response shortly. Pets on a 6-foot leash are allowed on the surrounding grounds of the centers. They may not enter the pool area.